WRIGHT CATTLE - are distinctly different from all the others. The old family were nearly all duns, reds and line backs. There was a unique, slight dish face on many. They were somewhat long in body but not real tall. Some had a long goatee like growth of hair hanging from the top inner ear protecting it from tropical insects. M.P Wright Jr. felt the shaggy hair was a nature thing to protect "true" Longhorns from ticks and insects who like to get in ears. It is possible the Wright herd was the oldest of the 7 families of Texas Longhorn cattle. Several generations of the Wright family enjoyed a huge steer herd. It was the largest herd of steers of any TL ranch. The Wright cow herd ran about 300 head. The Wright family ranched and were highly successful in the gravel materials business. They were mostly known on registered cattle papers as Wright Materials. The gravel plant was a bee hive of activity with semi loads of stone moving across the office scales to create road structures in the Robstown, Texas area and surrounding counties. In the early days of registered cattle many of the first 500 were Wrights. 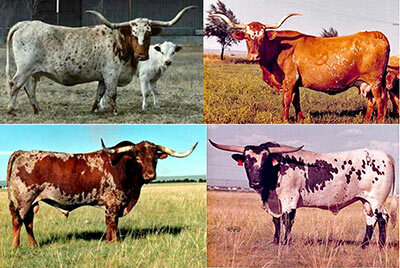 Wrights were serious about pure Longhorn blood, but always used multiple herd sires and registered them as single sires. They were active in the auctions and consigned a gooseneck load of cattle to the sales they attended. Every July 4th there was a huge Catholic church picnic near San Patricio. The Wrights made a big family deal out of the event. To create some interest Chico would bring a big Texas Longhorn steer in a trailer and the attendees would try to guess the weight. Prior to the guessing, Chico would weight the trailer and the steer in the trailer on the official mine scales and seal the weigh tag to be opened after all the guesses were done. Good ranchers and old cattlemen would guess the steer several hundred pounds under the official weight. Often some person who had no experience would guess a very high weight and win the contest. Chico had a lot of fun with it. He would have a couple truckers stand on the trailer when he did the official weigh ticket. In reality, the person who won was normally about 300 lbs over the real weight. The old cattlemen each year were surprised that Longhorns weighed a lot more than they looked like. About 20% of the registered cattle are Wright blood back in the foundation of the pedigrees. Wright blood flows in some of the best cows in the breed. The first cow in the Longhorn breed to sell for over $10,000 was "Wright 489" who was dam of the great "Doherty 698." Later, a Wright cow named Alma II became the grand dam of Senator. Wright cows are extra feminine, very trim necks and straight backs. The combination of Wright female lines with modern popular blend families has produced some of the breed's most valuable cattle. At one time the historic Wright blood was intensely inbred. To stop this practice, Butler, WR and many other families' bloodlines were introduced to out cross. Well known bulls purchased by Wrights to add to their blends were the black bull Don Quixote and the early well known Butler bull Bold Ruler. The bull by Texas Ranger, Mr. Texas was purchased from DCCI. Although few recognize a Wright cow today, the Wright blood is embedded in the history of modern cattle running through the veins of progeny from Don Abrahan (his dam was a Wright cow which sold for $30,000), Overwhelmer, Phenomenon, Heavy Hitter (dam Inez of Acampo was a Wright cow), Widespread, Quinado Fandango (dam was a Wright cow), Drag Iron, Gunman, Rio Catchit, Shadow Jubilee, RM Miss Kitty, G-Man, etc.